The Spring 2019 issue of Digital Camera magazine comes with ACDSee Photo Studio Ultimate 2018 software (Windows only; 12-month licence) worth $79.99, and 13 other fabulous gifts. The issue is packed with all the features and regulars you'd expect from the world's favourite photography magazine, including 18 pages of photo projects to make you pick up your camera and get excited about the new season. Find out how to ace misty morning shots and seascapes, gather some pointers for capturing cats, and get some pro insights for capturing movement from dance photographer Verity Hesketh. And with 'Spring' in the issue title, our lead feature is an essential guide to photographing gardens and nature, with 22 tips and tricks for getting the most from spring's longer days and (hopefully) warmer temperatures. 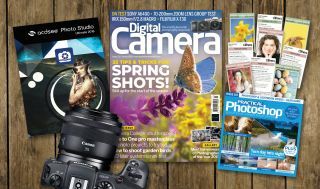 The Spring 2019 issue of Digital Camera is on sale now – get your copy today!